The festive season is here and Liverpool's squad visited the local school kids to surprise them with Christmas gifts after the Premier League weekend. The festive season is here and Liverpool’s squad visited the local school kids to surprise them with Christmas gifts after the Premier League weekend, where Liverpool defeated against the Wolverhampton Wanderers to go four points clear at the top of the Premier League ahead of title rivals Manchester City. It’s all joy at the Anfield camp as Liverpool are having a stellar season and are undefeated in the Premier League. This is also the first time since the 2014 season that Liverpool will be heading into the boxing day as the league leaders. The Liverpool players visited a local school at the Merseyside and surprised the local school children as the football stars sneaked in from behind and also gifted them with some gifts. Jurgen Klopp and his men have been lifting the spirits at the red half of the Mersey side with stunning performances. Last year, Liverpool surprised the football world as they went on to the finals of the Champions League and they have carried on their form to the new season and are the frontrunners to win the Premier League. If they go on to do so, it would be the first time in the club’s history to win the league in the ‘Premier League ‘era. The club has won the league on 18 occasions but none of them have come in the Premier League title. 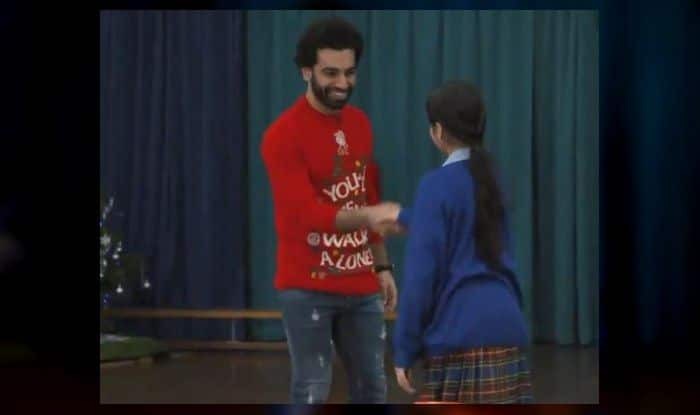 Mo Salah is one of the favourites among the Liverpool fans and the school children were over the moon on seeing their hero appear in front of them. The Egyptian has played a crucial role in turning around the fortunes of Liverpool, winning the golden boot and ‘Player of the season’ of the Premier League last season after becoming the top scorer of the league. Liverpool’s camp is lit with joy and high spirits ahead of the crucial boxing day match against Newcastle United led by their former boss Rafa Benitez. The Jurgen Klopp led side are favourites on paper and will look to build on their winning run in the campaign.